Hi everyone! 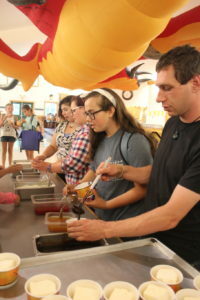 Curly Q here making my debut appearance on the HVC blog to relay last night’s spectacular events! 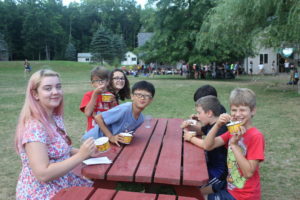 The campers topped off a sweet and treat filled junk food day by enjoying ice cream sundaes with toppings of their choosing! How fun! 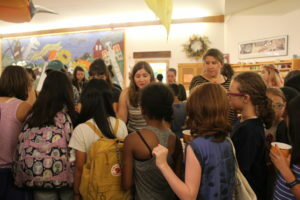 After everyone was finished the camp made its way down to the rec hall to enjoy a show. What kind of show you might ask? The staff talent show!!! Ham and Brock made another appearance at HVC by acting as our wonderful MCs of the night. 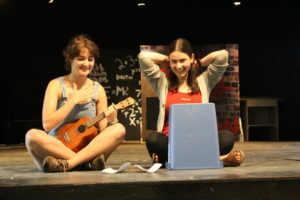 Izzy and Eva (counselors of French Quarter and Paquatahnee) performed an original song. 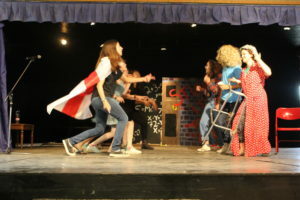 The AWACs got on stage and were our very own spice girls for the night! 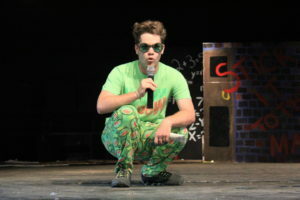 Ben (Wombles counselor) gave an original performance that left camp slightly confused but very entertained! A lot to do with cream and CDs. Next up we had a group of staff (including two of our PDs, Georgia and Alanna) perform a well choreographed dance to Mulan’s I’ll Make a Man out of You. 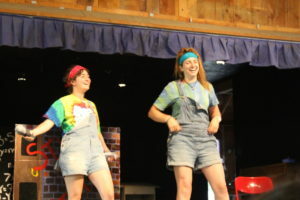 Anisa wowed campers and staff alike when she took the stage and showed of her incredible dance moves!! 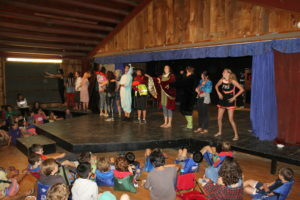 Tanya had the whole camp laughing when she got on stage in a unicorn onesie and roller-skates and demonstrated what it would be like for a baby unicorn to take its first steps. Serious originality at this talent show! Theo (Taj Mahal counselor) showed off her high kicks when she got her leg over one of our tallest counselors, Kate, without leaving a scratch! 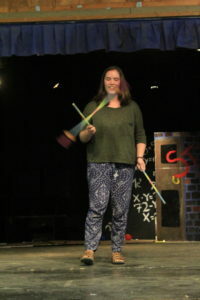 Anna juggled on stage with skill, something that I could never do! 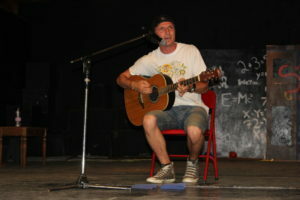 David (Wombles counselor) got on stage and performed a song that had the crowed cheering by the end. 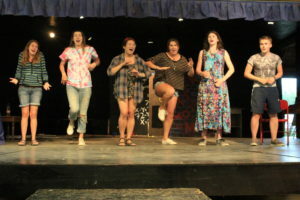 The Macarena Crew followed when a group of counselors took the stage, dancing to the Macarena while songs continued to shuffle. All laughs here! 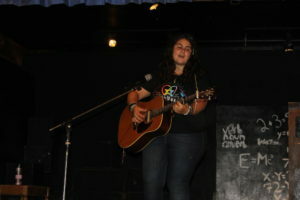 Finally, Sara finished off the show with another wonderful song. 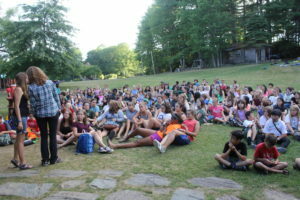 Once the show was over, campers made their way back to their cabins and settled in for the night in anticipation for today’s lazy day! Younger half is staying on camp for Almost Olympics Day and older half is taking a trip to the Bangor State Fair! More reports to come and thanks for reading! Until next time! 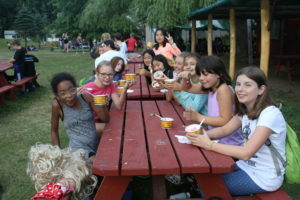 Camper’s patiently waiting for PDs Grace and Alanna to send them in for ice cream sundaes! This original song told of a story of love in a math class. One maca two maca three macarena!! How high could you kick? !